Ginny's Gems: Home Management Essentials. 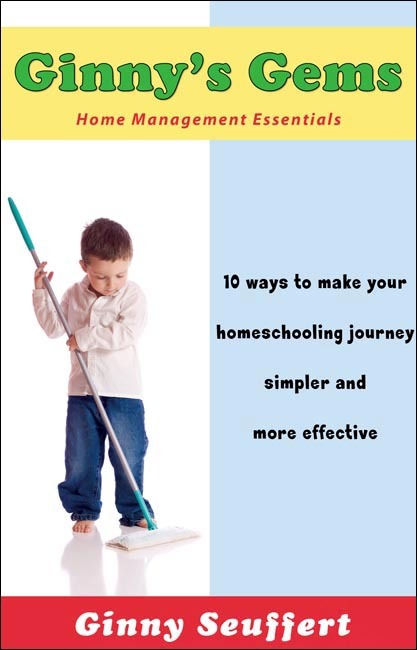 Popular speaker at Home School conferences, and home schooling mother of 12 children, Mrs. Virginia "Ginny" Seuffert, offers a straightforward, practical guide to managing your home and family life amidst the exciting challenges of home schooling your children. Ginny delivers her practical advice in her natural no-nonsense, commonsense, and humorous manner. This great book is intentionally short so that every busy home schooling mother can benefit from reading it. Turn the messiest, unorganized house into a tidy, cheerful home! Possess the plan to keep the chaos under control while bringing a peaceful way of life to your household! Copyright 2010. Soft cover. 50 pp. I loved this book as I love Ginny's column in the Seton newsletter. I only wish that it was bigger! Maybe there will be more? Thank you for your encouragement and commonsense approach to issues that we all face. Having 7 children ranging in ages 12-1, I loved that it was a short, easy read---soooo practical. I'm joining the ''white towel '' club and hope to simplify my life. I love Ginny's practicality and humor and very positive outlook in raising a large family. I heard Ginny speak at the homeschool conference in Memphis. She was so pratical, motivating and funny, too! She is why we went over to the Seton table and have been homeschooling with Seton since. Can't wait to read this! I LOVED this book!! Short, sweet, and to the point. A great reminder of why we homeschool, and what to do if we have deviated from our main goal: HEAVEN! !